Submitted by Al Pounder. One of our UK 410 shotgunners. Some might believe that the average citizen can’t own a gun inEngland, let alone a silencer, but my handy little suppressed .410 is proof to the contrary! I shouldn’t need to explain the many great attributes of the diminutive .410 to experienced shotgunners, so I won’t. Coupled with an effective silencer, this is a tool that any serious hunter, pest controller or even home defence proponent should have in their arsenal (I’ll explain that last one later). Total length is 52” with the 9” silencer fitted to a 26” barrel. Silencer could be fitted to a shorter non-ribbed or de-ribbed barrel extending at least 2.5” forward of the magazine tube. eliminates the possibility of the wad causing a bore obstruction and a potentially lethal detonation. It is worth noting that the .410 has one of the highest chamber pressures of any common shotgun. Plastic wads can be used if the barrel/silencer is checked after each shot. Slug rounds can also be fired through the silencer with any choke. Slug ammunition is highly restricted in theUK, so I won’t deal any further with it at this time. Fibre wad or subsonic ammunition may not be available or affordable where you are, so hand-loading may become a necessary but very enjoyable hobby! With the silencer fitted, perceived noise to the shooter is greatly reduced and comfortable without hearing protection with all loads tested. 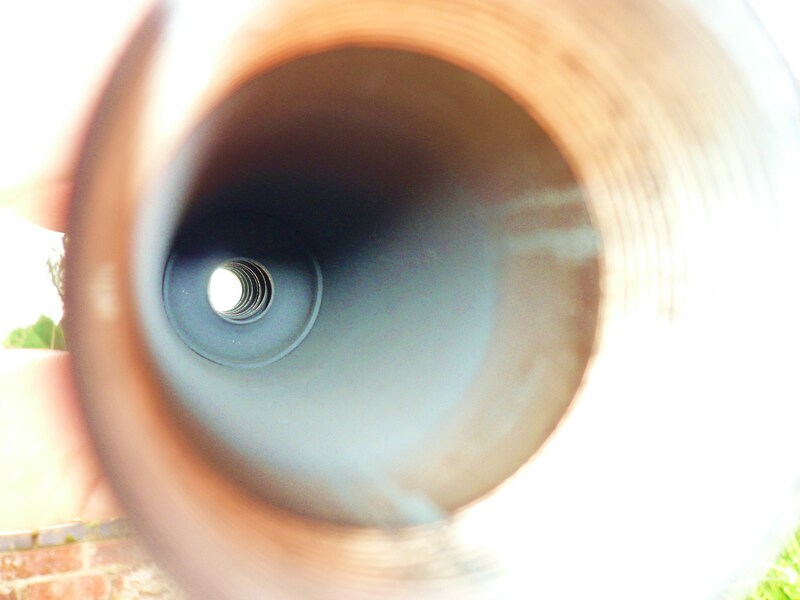 Recoil is reduced to virtually zero and the suppressed muzzle report is unrecognisable as a gunshot. Subsonic ammunition was not noticeably quieter to the shooter than supersonic, but when observed from a distance by a spectator, the supersonic crack which accompanied standard loads was clearly absent. This resulted in a slightly quieter overall shot. Plastic wads left some residue in the silencer, but checking the barrel after every shot, no dangerous obstruction was observed. Heavy subsonic loads killed small game well but required more forward leading of moving targets than the standard, faster loads. Patterns remained tight and dense out to a maximum effective range of around 30 yards with all loads. Fibre wads opened patterns by about 1” compared to plastic. The Winchester Super-X buckshot produced a 5 shot average pattern of 2.5” at 30 feet! This load was also comfortable to fire indoors through the suppressor without hearing protection. Conclusion: With birdshot loads, this silenced .410 is incredibly quiet and lethal on small game to 30 yards. The suppressed shot does not scare away surrounding wildlife and can for instance allow a flock of birds or a group of rabbits to be repeatedly shot at without the others fleeing. Whilst this is also achievable with a suppressed .22 rimfire, hitting moving targets is infinitely easier with the .410. The .410 is considered by many shooters to be a child’s or novice’s gun. I would argue that it is actually an expert’s gun. It requires a more accurate shooter to put the smaller, sparser shot pattern in the kill zone, but a pellet from a .410 bore typically carries as much energy as a pellet from a 12 gauge. I will not draw many conclusions about Winchester’s buckshot load as I have not tested it on simulated or living targets. I can say though that it suppresses well enough to fire indoors without hearing protection. I would also speculate that five 000 buckshot pellets fired at 1135fps, hitting in a 3” circle should cause devastating results in a defense or hunting situation. This load also shot accurately to point of aim when I account for the fact that the suppressor puts the shooter’s line of sight high and subsequently, the gun shoots slightly low. Drill and tap the receiver to fit either ghost ring or red dot sights. A bead sight can be attached to the silencer itself or a front sight mounted on a rail clamped to the barrel. 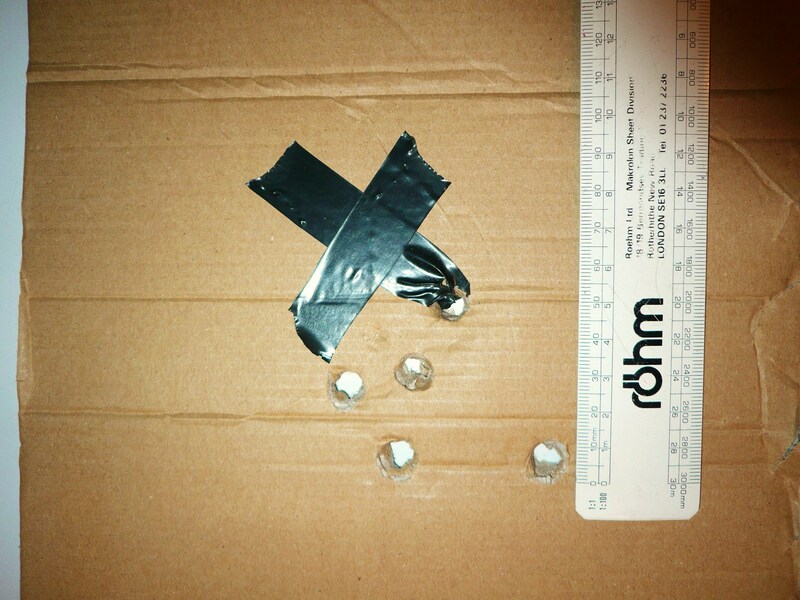 Experiment with home-loaded subsonic buckshot loads. Get out and shoot more!..